It seems like it was just yesterday she was running through meadows, pigtails flying, grin from ear to ear, picking daisies and doing cartwheels. Now, in the blink of an eye your baby has turned into a sophisticated woman, dressed in white, glowing with joy, and today of all days will become an indelible imprint in your memory – it is her wedding day. How did it happen? Where did the time go? Even though someone probably told you along the way that men don’t cry, you might feel a sudden flood of emotion today. It’s a day of joy (hooray, she is out of the house and this will hopefully be the last time she costs you money) and loss (you won’t be the number one man in her life anymore). In honor of Father’s Day next Sunday, we wanted to take a moment to tip our hats to those remarkable men who give so much and get so little – Dads. 1. Bring a handkerchief and keep it in your tux. Odds are good that your calm, collected, sophisticated daughter will cry as you walk down the aisle with her, and it’s nice to be able to offer her a handkerchief in her time of need so she doesn’t have to sniffle through the whole ceremony. There may also be a teeny tiny chance that you get misty as well, so if you can find a way to pack two that is even better. 2. Give your daughter your blessing out loud. This may seem antiquated, but even if you didn’t require her fiance to ask for your permission or blessing, you may want to take a moment on her wedding day to let her know that you wish them well. A bride with last-minute jitters finds enormous comfort in the reassurance of her father that she has chosen well. 3. Consider dance lessons to surprise your daughter for the father-daughter dance. If dancing isn’t usually your thing, don’t worry! No one expects perfection from your dance. They will, however, be impressed if your dance includes a few turns, a dip, and a smile from you. These things should be achievable in less than an hour of practice – so wow the crowd. 4. Take the time to plan your toast. Wait, did you know it is traditional for the father of the bride to give a toast? Well, it is. After all, it is also traditional for you to pay for the wedding, so folks expect to hear from their hosts. Practice your whole speech beforehand to make sure you say the things you want to say (and don’t say the things you would be better of without). In this day and age of technology, you might even find that a power point presentation with accompanying embarrassing slides of her as a toddler lends itself to a festive mood. 5. Try not to take any insensitivity personally. Brides have so much pressure on them, especially in the last week of wedding planning, and it is sometimes the moment they say something insensitive, or forget to ask your opinion. Please remember, that even though today she is marrying someone and leaving you forever – you will always be her Daddy and she will always need your strength, courage, humor, and warmth in her life. So, thanks Dads. You are unforgettable. Do you have a tip for a future Father of the Bride? Leave a comment with your own ideas. We’ve heard of personalized bags, towels, jewelry, but when we ran across this fun new idea for Bridal party gifts, we just had to share it. These awesome hangers come with whatever you like written in the wire of the hanger. For example, you could get these for your Bridesmaids and have each of their first names bent into the wire. Then there’s no risk of getting the dresses mixed up and they have a keepsake from the day. You could also go with nicknames or silly titles (I am thinking “future Mrs. Brad Pitt” or perhaps something shorter like “the fun one”). 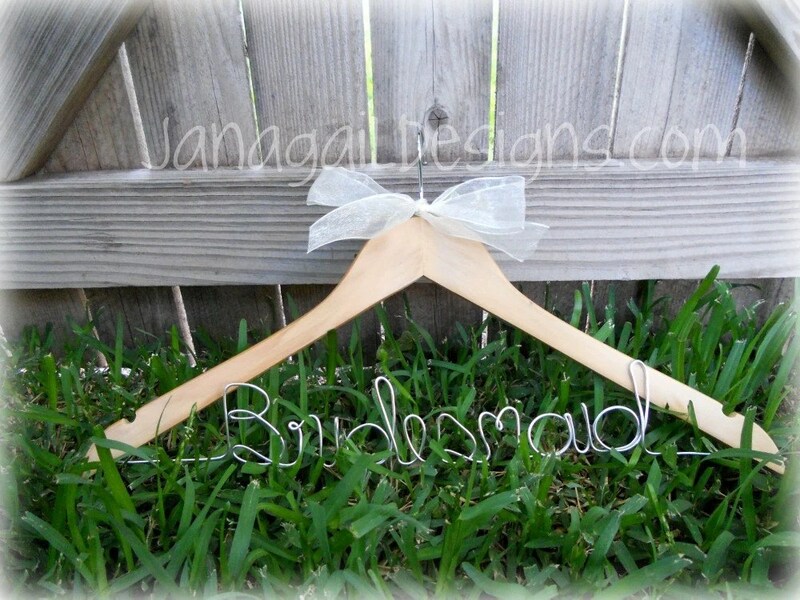 There are lots of vendors who do this type of hanger personalization, but the picture above comes from Jana Gail Designs. If you choose to get these, look for hangers specifically designed to hold up heavy gowns. Some are too flimsy for heavy garments and though it will look pretty, a hanger you can’t put your clothes on is not worth it! Happy Mother’s Day everyone. In honor of those very special women, today’s post takes a shift from our usual focus and talks specifically to Moms of Brides-to-be. So your daughter (or son) is getting married. Congratulations! You have probably thought about this day for 20+ years, wondered who their spouse will be, imagined how beautiful/handsome they will look all dressed up, and cried over losing your sweet baby. I know I have and my kids haven’t made it out of elementary school. What do you do now that the day is arriving? Here are a few tips to help you get through one of the most momentous days of your life. 1. Remember that the wedding will only last a day, but your relationship with each other will last a lifetime. When I got married I honestly sat around trying to think of one good thing about my Mother, and had trouble thinking of anything. Now, as a mom myself, I have a list a mile long of reasons I am grateful for her. Something comes over your brain when you are planning a wedding and I am sorry to say that brides often have trouble thinking of other people when they are overwhelmed with choices to make. Please don’t take it personally. It happens to the best of us. Remember that if you can show her how to ride through this difficult time with grace and compassion, she will be stronger for it. 2. Offer to help in any way that she/he needs. This is a hard one. Especially if you are an expert with flower arranging, or a decorator, or a photographer. Even though your taste is impeccable, it might be that the bride and groom need to make these aesthetic choices together in order to grow in their relationship. Which means you might be able to help them with their marriage by licking envelopes rather than trying to design and bake the wedding cake yourself. But when in doubt, offer to help. 3. Be ready to catch when things fall apart. Things will fall apart at one point or another. The wrong cake will arrive, the caterer will go out of business, the hotel will catch fire, etc. This is when Moms shine. We spend years washing boo boos, fixing scrapes, and kissing the hurt away. Don’t wait around hoping stuff will go wrong – so you can swoop in and fix it, but be ready to help at a moments notice. Consider carrying a stage manager’s kit the day of the wedding. In a theatre, the stage manager is the person in charge of fixing everything so that all the audience sees is a flawless performance. They often bring a kit, with duct tape, safety pins, needle and thread, sharpees, etc. You can do the same by bringing a wedding kit. Include clear tape, markers, paper, needle and white/black thread, extra buttons, bobby pins, hairspray, a pen, fabric glue, and anything else you can think of. If her dress gets a tear, you can whip out your needle or your glue and fix it. Hair falling down, grab a bobby pin. Knowing you have her back is going to help your baby enjoy the best day of her life. 4. If you live far away, volunteer for jobs that keep you in contact with the couple. Accepting RSVP’s is great for this, as you get to update the couple on who is attending and it keeps you in contact with them. 6. If you end up doing most of the work, check in with the Bride and Groom to confirm the choices you have made will suit them best. Getting married is a sacred journey: terrifying, wonderful, stressful, exciting, horrendous, and joyous. Watching your child take that journey… well there are no words that adequately express the experience. Love each other. Embrace your new child-in-law. Respect the adult you have raised. Most importantly, savor each moment. You are the single most influential person in the life of your child, and you will always be. Way to go Moms. We salute you. And if you wanted to use your influence recommending Captured Emotions as the wedding photographer, well we would salute that too. We all know there should be cake at a wedding, but a fun new trend that is popping up is to also have a “Candy Bar”, the cute little name for a Buffet of candy guests can grab from at the end of the night (or all night long if you like). These can be elaborate or simple, you can theme them with your wedding colors or do it yourself with homemade candies (we strongly recommend delegating out that responsibility!!!). Candies like M&M’s can be bought in single colors now, so the sky is the limit. When I was a kid growing up in Endicott, NY there were a few little pleasures I always looked forward to. Pleasure one, was going out for Pat Mitchell’s ice cream. Pleasure two, was selling (and eating) Gertrude Hawk candy. And pleasure three, was getting to visit a little candy store in Endicott, NY not too far from OLGC which sold nickel candy in every variety imaginable (or so it felt at the time). Since my parents weren’t too fond of passing out candy, I distinctly remember that euphoric feeling of finally being allowed to go in the store with my dollar and buy bunches of nickel candy. It was like walking into 8-year-old heaven. It came in a crinkly brown paper bag and the feeling was a mixture of Halloween and Easter rolled into one. Your wedding guests might just feel the same way too when they walk up to your candy bar and don’t even need a nickel to enjoy some of those awesome childhood treats. What fun we had taking outdoor winter engagement pictures. While Alicia and Rich met at church, when it was time to pop the question, Rich proposed in Binghamton, NY’s beautiful Wolfe Park and Alicia said YES! So it only made sense to take their engagement portraits there as well. We have said it before here on this blog, but giving friends and family a glimpse into the special moments you share as a couple wins big points. Anyway, check out the beautiful pictures and enjoy a few of our tips for taking great outdoor winter portraits. 1. Get a cute scarf, hat, gloves, etc. and plan on taking your pictures wearing winter gear. We want you to look happy and in love, rather than frozen. Also, wear layers. That way you can add and subtract warmth as needed throughout the session. And finally, pick bright colors to contrast with the winter foliage. 2. Bring a hot drink. It’s nice to have some coffee or cocoa waiting for you between locations. 3. Talk with your photographer ahead of time so she (or he) knows more about what kind of couple you are and what makes you, well, you. Since your engagement session is a part of your wedding package at Captured Emotions, this will have the added bonus of helping us make your wedding portraits even better as well! What makes you, you? Playing Guitar together? Or is it making snowballs? 4. Choose Captured Emotions as your photographer. This seemed like a given if you live in the Binghamton area, but it had to be on the list. If you don’t live in the Binghamton area, we are happy to travel so feel free to consider us anyway. If your “destination wedding” is in Boise, Idaho that’s fun too. 5. Wear a good makeup foundation. Standing in the cold will make your cheeks and nose rosy, which is adorable, but you can temper that effect by applying a good foundation before you hit the cold. 6. Have fun out there! Posed smiles are nice. Genuine joy is catching. Upstate New York in winter is one of the most beautiful places in the world. Chances are, if you are reading this blog you already get to live here, so take advantage of it while the snow lasts. Recently, we photographed Stacie and Scott’s wedding and reception at the Owego Treaway Inn. Just look at the gorgeous flowers and reception design. Every detail of this wedding was exquisite and elegant. Congratulations Stacie and Scott, for designing a beautiful wedding and a beautiful life together. We wish you a lifetime of happiness. 1. Use leaves collected in autumn as your “rice” substitute. Not only are they colorful, they are certainly biodegradable and add a touch of class to a fall wedding. 2. Instead of driving away in a limo – find a rickshaw, or take a bicycle built for two. We think this would be fabulous, as long as you don’t have far to go, and you change into your “going away” outfit. Poofy gowns and bicycles may not be a winning combination. 4. Rather than cut flowers, consider having bouquets made from potted flowers that you can save and plant in your yard after the ceremony. Use potted trees, shrubs, and plants to decorate the church and reception site and use them all in your own landscaping. Why not keep them forever instead of just throwing them away? 5. Sew the garter from something you already own – a handkerchief, your mother’s wedding dress, your christening gown, etc. Those are ideas we came up with. Leave us a comment and tell us if you have any more to add! Fun idea friday is our way of celebrating new twists on old traditions, and this week is no exception. Today we are celebrating those fun wedding ideas that brides and grooms use to entertain their guests. The first dance: last weekend Sarah and Alan really changed things up with the first dance. It started off like a typical, romantic, slow dance until the two of them broke out into fun choreography that added a special touch to the day and kept their guests smiling. The newlywed game: for some reason, this is really popular right now, and it might just be that it is so much fun! The bride and groom each sit in a chair with their backs to each other. Each one is handed two rubber duckies on a stick – one groom duck and one bride duck. As they are asked questions, they each answer by holding up either the bride duck or the groom duck, but since they can’t see what their spouse’s answer is, its fun to see how well the couple know each other. Singing together: every once in a while a couple will both be musically talented. This bride and groom took out the electric guitar and performed for the guests. We think this is so cool, as long as you really do have a gift for music. Picture slideshow: projecting pictures of the two of you growing up during the reception helps your family remember the good times you have had together. This is especially beautiful if you grew up together. I met a new friend yesterday who had known her husband since the 3rd grade, and although they didn’t date until college, there are tons of pictures of them growing up together. Now that would make a great slideshow! Whatever your level of comfort is being in front of people, adding that fun performative touch to your reception will help make your nuptials an evening for your guests to remember. In this economy, or let’s face it, any economy, if you are planning a wedding, money is one of your major concerns. So let’s talk about realistic ways to cut down on cost and still have a wedding you are proud of. Choosing which items to cut back on is a very personal decision. But here are some ideas, and some cuts to avoid we think you should know. Limit the number of guests at the reception. We think this is pretty self explanatory. The fewer people you have to feed and water, the cheaper your event will be. Have a cash bar instead of an open bar. This decision is pretty dependent on the amount of drinking your friends and relatives are accustomed to. It certainly saves you money, big money, but it may feel cheap after the fact if people weren’t able to have a good time because they didn’t know to bring cash. Don’t have a full dinner reception. This is tricky if your reception venue requires you to use their caterer, but I have always been partial to a dessert reception. Get married at sunset and then provide special coffees and teas and a whole host of desserts which includes but is not limited to the wedding cake. If you don’t mind getting up REALLY early, have a morning wedding with a brunch reception – eggs and pancakes are much more cost effective than steak and chicken. Just keep In mind that you will have to get up while it is still dark out to have your hair and makeup ready for a brunch reception. Hire a DJ rather than a live band – maybe. Check the prices. You really get what you pay for when it comes to wedding entertainment so you may find it is generally cheaper to get a DJ over a live band, but if all you want is a guitar playing acoustic melodies then you may be able to find a musician to do that for a similar price. Don’t do your own hair and makeup. Having someone else do these for you is a pleasant experience, so enjoy it. You don’t get married very often and you need to have some luxuries, even on a tight budget. Plus, you will be the centerpiece of most of the wedding pictures so you need to look really nice. Don’t forget to do your nails – even if you aren’t usually a manicure kinda gal. This is one you can probably do reasonably well yourself or ask one of the Bridesmaids to do if you are trying to save money. You will probably have lots of pictures with your hands in them, because that is where the rings are. Don’t cook the food yourself. One bride I knew stayed up all night before her wedding making spaghetti dinner for all of her guests to cut down on the cost. Don’t do it. It is not worth it. If you want a homemade meal, give your spaghetti recipe to cooks you know and have everyone bring some with them. There will be food for all and less stress for you. Have more money saving tips you want to share? Leave a comment and let us know. Ooooh, I love flowers. Love, love, love them. Weddings are the perfect time to let those blossoms speak for you and make your wedding special for you. From centerpieces, to pew decorations, to bouquets and boutonnieres, the flowers you choose can have an incredible aesthetic impact on your wedding day. Are you a daisy kinda gal? Do orchids speak more to your exotic side? Would traditional roses tell your story the best? Recently, we photographed a wedding with exquisite floral arrangements from MacLennon’s Flowers. Here are a few samples. If you like what you see, consider contacting MacLennon’s http://www.maclennansflowers.com to be your florist. Why, you may ask, would we take so many pictures of the flowers? One of the things we do really well at Captured Emotions is to try to capture the details of your day. So that means we photograph your cake, and your flowers, and your centerpieces, and your shoes, because you may never get to see those details until the wedding is over! Flowers are especially great subjects because they just don’t last past your wedding (or maybe through your wedding if you made the mistake of using tulips in your bouquet on a hot summer day). You can look at your toasting glasses in person, every time you go to the cupboard, but your flowers are going to fade. Maybe you preserve your bouquet, maybe you press a few flowers into your guest book, but they will never be the same again. Flower portraits also make really great backgrounds in wedding albums. Have we mentioned here that we make fantastic wedding albums? Why use a generic stock photo of a flower in your wedding album when you could use a photograph of your flowers? We’ll talk about our albums more in another post – they are worthy of a post to themselves. 1. Many blue flowers (like the blue iris) are NOT BLUE. They are purple. If blue is one of your colors, choose flowers carefully. 2. Some flowers fade in the heat very quickly (note our mention of tulips above). Make sure the ones you use are appropriate for the way you want to use them. If you must have a delicate flower in your bouquet, see what your florist can do to keep them cool so they will last through the day. Trust your professional – not blindly – but because you have looked through LOTS of their samples, pictures, examples, etc. And of course, whatever you choose to do with your flowers, make sure you hire excellent photographers to help you remember how beautiful they were for the rest of your life!